…I asked if it’s refrigerator was running. If you want to follow me, you will need to sign up at my new blog, otherwise, you’ll never hear from me again because this is my last blog post here. PS: I inadvertently re-published all of my old blog posts, including a draft that was never published on Lyme Disease (now deleted). The bad thing, is that I clogged up a lot of feeds and probably confused a lot of people. The good thing, is that I gained a lot of new followers! I hope you will sign up at my new blog and follow me as I make a second attempt at thru-hiking the Appalachian Trail all the way to Mt. Katahdin in Maine. 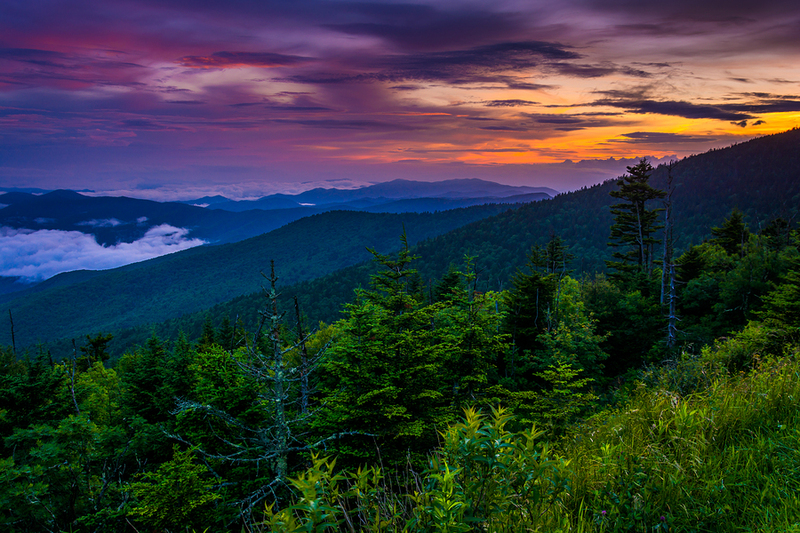 Sunset from Clingman’s Dome Great Smoky Mountains National Park Tennessee. Though I have been thinking and dreaming for a while about a doing a thru-hike on the Appalachian Trail, I didn’t ever really think it would become a reality. Then, the topic came up again and I decided to talk it over with Bud (my husband). I was very surprised at how supportive he was of the idea. The option of him hiking with me is out due to his knee problems. One thing led to another, and he said, “Well, better to do it sooner, rather than later.” So…here I am, planning for my 2016 thru-hike! He has been incredibly encouraging. In the last two weeks I have spent a great amount of time researching gear on the Internet. I am (of course) trying to keep costs down as much as possible. Though it is important for all hikers to keep their pack weight low, I feel like it’s imperative that I, especially, keep the weight down since I am built so small. Unfortunately, lighter gear is usually more expensive. Bud has budgeted money for my gear (based on what others have said gear will cost.) The figure I have seen estimated was around $2,000. I’m hoping to keep it much lower than that, while not sacrificing quality (or low weight) too much. All of these are just too narrow, and even if I ordered a size up, they would STILL be too narrow and would probably slip on the heel. Since walking is all I am going to be doing on the hike, it’s important that I get a shoe that fits right. I am thinking about giving up on ordering shoes online. You can just never tell if a shoe is going to be wide enough without trying them on, unless they are sold in widths (and very few seem to be.) Postage to return things that don’t fit is too expensive. It was around $15.00 to return one pair of shoes! Sorry to sound like I am complaining, but I am in shock. I think I am going to drive to Little Rock (almost a three hour drive one way). It’s the closest place that will have a decent choice of hiking shoes, clothes and gear. 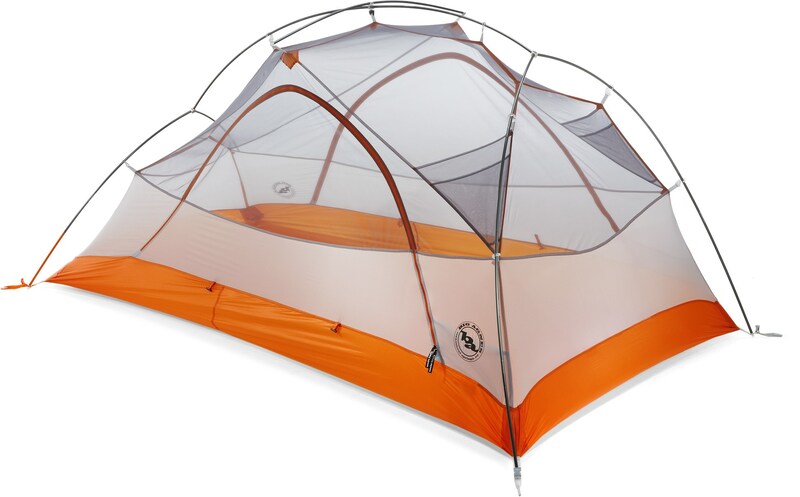 I ordered my tent, a Big Agnes Copper Spur I. It is an ultra-light tent. I got a great deal on it on Amazon. It was so easy to set up, and was, indeed, very light! Then, the other day, I saw that REI had their Big Agnes Copper Spur 2 (a 2 person tent) for only $5 dollars more than I paid for the one-person version, and the weight was not all that much more. It will give me more room, should I want to keep my gear inside the tent. Also, if Bud wants to go with me on a pre-thru-hike trip to try it out, we can both fit in the tent. If the Copper Spur 2 turns out to be as great as I think it is, I will return the Copper Spur I.
I have also ordered and received my backpack. It is an REI Flash Pack 58. 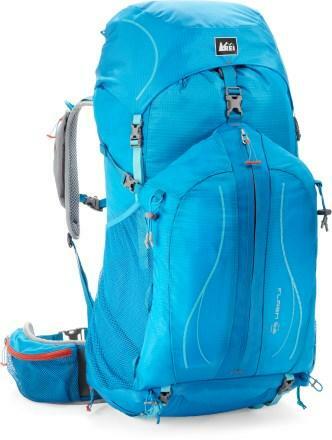 It is an internal frame, lightweight pack. It was on sale, it was blue (my favorite color) and it had some great reviews. I also like that it has so many outside pockets. I hope it will serve me well! I have been walking here at home as much as I possibly can. We are in the Ozark Mountains here, so there are plenty of hills to help get me into shape. I bought a pedometer which tells me how many steps I take, how many miles I travel, how many calories I am burning and how many MPH I am walking. Pretty cool. I have been doing 5-6 miles at a time, but not every day. It is surreal to think that this time next year I will be thru-hiking the Appalachian Trail. It’s all I think about lately and I’m so excited I’m about ready to bust! You’re only as old as you feel, right? I’m 50 years old. Most of the time, I don’t even think about ‘age’. It doesn’t usually bother me, but lately…it’s been on my mind a lot. 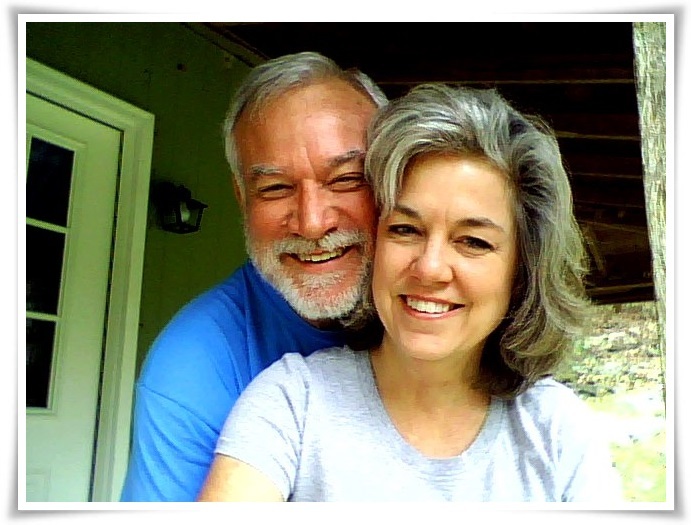 I certainly don’t FEEL like I’m 50…but 50 is almost 55 and 55 is almost 60 (and so forth and so on.) I have gray hair, yes. It is my choice and I don’t regret growing out the color, and I like it. That’s really not the deal. I’ve read that there are ‘retirees’ on the trail, and quite frankly, I have seen a LOT of trail journals for them. The other majority are the young’ns in their 20’s. Not many in between. I guess I just feel like I’m in the Twilight Zone for ‘age’. What kind of hiking clothes am I supposed to buy? The athletic clothing is a mystery to me, anyway. I’ve never had to wear them. Base Layers. Middle Layers. Medium weight. Light weight. WOOL! I’ve never worn wool in my life, that I remember! I just don’t think I’m going to look very cute strutting around in my gray hair and woolen long undies. Apparently, that’s what people wear in camp after a day of hiking when it’s cold. I’m really young at heart! Still… I’ve been thinking a lot about the time a couple of years ago that my Dad told me that I was no Spring Chicken anymore. My DAD! Think about that. (Selah.) I felt like I had been socked in the gut! That was really a reality check for me, and the point at which I began to think that maybe I was getting kind of ‘old’. I recently joined a hiking forum. I have really been feeling the part, lately, and excited about my upcoming hike. I even donated $10 so I could edit my posts and have a custom Avatar picture. (The hiker cartoons they had on there to choose from were kind of lame.) 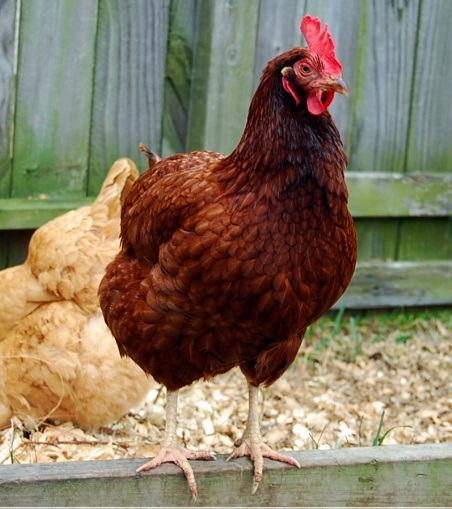 I posted a picture of Eula (one of my favorite chickens) for my Avatar. So I posted on the 2016 Thru Hiker’s thread…basically you answer some questions about your hike (When you are hiking, which direction, trail name, etc.) There was also a place to put anything else you want people to know. I posted all about myself and why I wanted to do the hike. Later, I decided it was dumb and deleted that part. It sounded like I was trying to hard or something. I bought a hiking skirt on Amazon. Believe it or not, hiking skirts are actually popular these days. I was excited about that, because not only are they cool, but there is one other VERY important thing to know about hiking skirts. YOU CAN PEE KIND OF DISCRETELY WHEN YOU HAVE TO GO IN THE WOODS. Normally, we women have to squat with our naked fanny hanging out in all it’s glory. (I hear it’s not all that uncommon to think you’ve found a hidden place off the trail to ‘go’, and then find that there is a switchback right in front of the place you thought was deep in the woods! Along comes a hiker and you are exposed! Gotcha! And so I thought that even though someone might catch me peeing in the woods, at least my fanny would be covered when I did it. 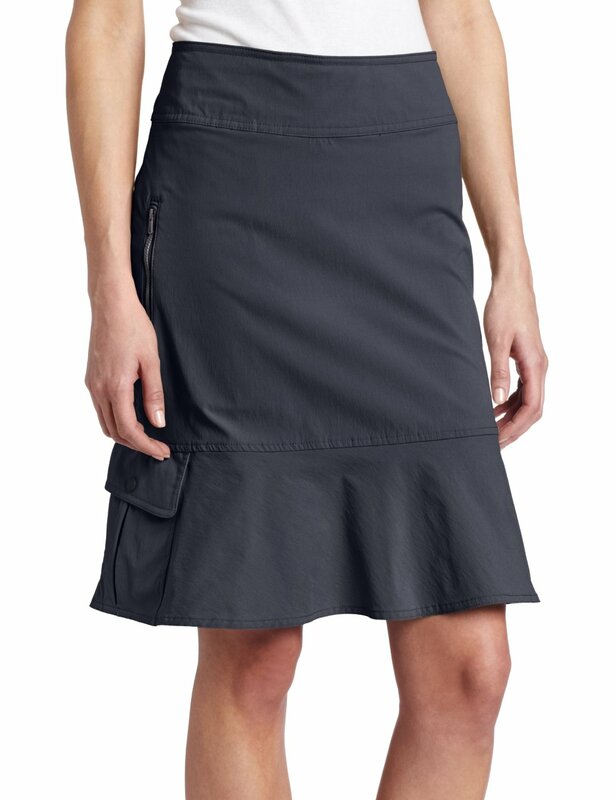 So…I ordered a hiking skirt. I thought it was a cute one. It was a longer one (to the knees)…because even though I’m in pretty good shape, I don’t think I can really pull off a shorter one at my age. Someone had started a thread about hiking skirts on the forum, so I posted a link to the hiking skirt that I had ordered. That went over like a lead balloon. No responses. I have found, though, that I pretty much tend to be a ‘thread killer’ on forums. Why I keep trying, I’ll never know. I guess it could have had something to do with the fact that I had a chicken for my avatar. I really wanted to wear that skirt today for my walk, but I was too self-conscious…especially since our ‘hood is densely populated with Mennonites. I just felt awkward. On a positive note, I walked 8 miles today…in my blue jean cut-offs rolled up just above the knee. It took me 2 hours. Unfortunately, on one downhill slope, my ankle sort of wobbled and cratered underneath me. Everything felt like it was in slow-motion. I landed on my knees. The momentum of being on a decline carried me down further onto my hands…and then…*BOOP*…you guessed it. Down on the ol’ noggin. The first thing I did when I realized I had fallen and actually fallen so badly that I bumped my head, was to look around. I was flooded with relief when I realized that there was no one around. I felt a little shaken, but I was okay. I could still walk. It scared me a little. Things like that can END a thru-hike if you are on the trail…especially for us old people. Thankfully, I only had little scratches on my knees and one on the left side of my forehead. I washed it off in the creek on the way home. I guess it’s a good thing I wasn’t wearing the Mennonite skirt, even though it was just me and the birds and squirrels. It WAS on the gravel road, though. Anyone could have come down that road at that time, you know. I have aches and pains now. I try not to go on and on about them, because well…you know…nobody wants to hear about it when you get to a ‘certain age’. I haven’t been able to determine whether the aches and pains are age related or otherwise. In spite of all of this, I’m still determined to do this. For those of you who doubt me, I will not be deterred! I WILL hike the Appalachian trail, all the way to Katahdin. I come from hard-headed, strong-willed, tough stock. Who cares what I look like while I’m doing it? Really?! I’m going to HMOH (Hike My Own Hike) no matter what I look like or what people may think. Devil May Care! At the age of 21, and fresh out of college, Jennifer Davis decides to hike the Appalachian trail. She hopes that it will give her time to think about what she’d like to do with her life. Jennifer is profoundly changed by the challenges she faces through her journey over the next four months. This is one of my favorite trail stories. Jennifer is a gifted writer. She has the ability to make you feel as though you are on the trail with her, going through every challenge along the way. The book also paints a good picture of what it is like to hike the trail as a woman, not only physically, but emotionally. Jennifer is also a Christian. For that reason, her perspective about the journey was important to me. There is something irresistible about stories-especially real-life stories-of insecure people who fight the odds, face their fears and end up becoming better, stronger people for it. It’s a very inspiring story. 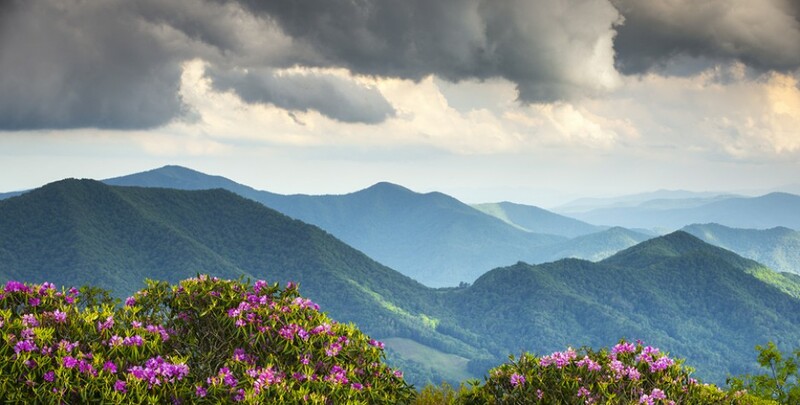 By the end of the book, you will feel like you have what it takes to hike the Appalachian Trail, too! I am still working on getting all of my gear…most of it I have ordered online. I did make a trip to a very small outfitter in Springfield. I was able to try on shoes, and it really opened my eyes about athletic shoes. I tried on SO many shoes, and was getting really discouraged because they were all too narrow and were squeezing my toes. The lady helping me finally brought out some Merrell Verterra Sports. I ended up getting a pair that was a size 8! (In regular shoes, I wear a 6.5.) They are very comfortable and roomy in the toe-box. I didn’t even ask her about different colors, though I think there are others. I was just so happy about finding a pair that fit after trying on so many that I didn’t care what color they were. There was a Bass Pro Shop just down the road, so I decided to stop there, too. I found a pair of Red Head Trail Runners (Mt. Whitney- Size 8.5) that were comfortable and roomy. I think this is Bass Pro Shop’s store brand (not sure) but they were on sale for $50, and I bought them thinking I could just wear them for home use if they don’t turn out to be good for hiking. 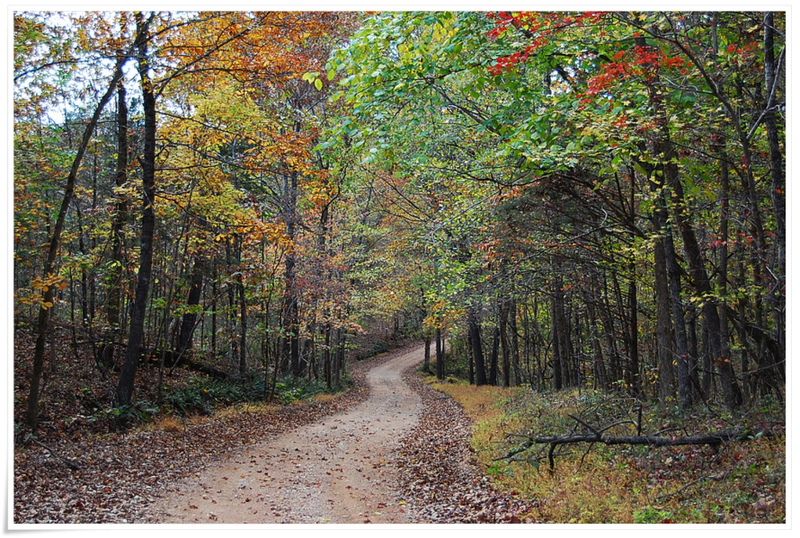 When I walk, I have been going to the end of our dirt road and back. That’s about 9.5 miles round trip with a lot of hills. I don’t do it every day. We’ve had either lots of rain or 100 degree heat indices, so I haven’t been regular, lately. I know, I know. I’ll be walking in worse conditions on the Appalachian Trail. I HAVE walked once in the rain. I just haven’t been psyched up for ‘real life’ hiking yet…haven’t even been out with my backpack yet. When I get all of my gear, I’ll load ‘er up and take ‘er out, come what may in the weather department. I did try out the Red Head shoes, and I had ‘hot spots’ (pre-blisters) when I got back. I was wearing my Darn Tough socks, and I want to try a nylon sock to see if that makes a difference. 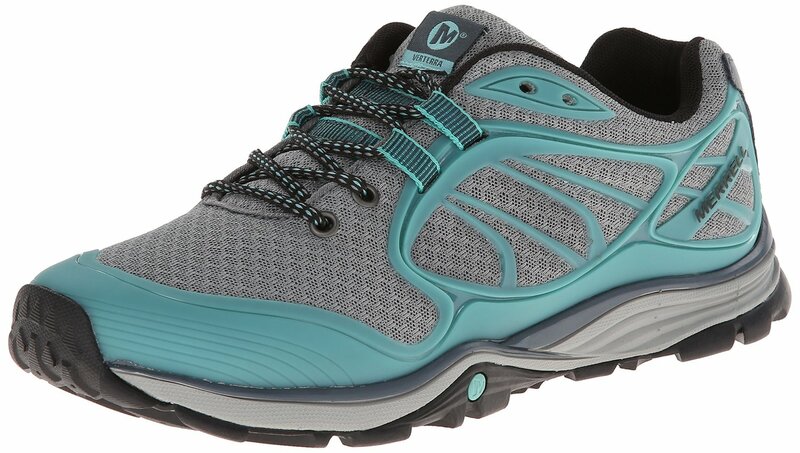 Haven’t tried the Merrells yet, but those are the ones I have high hopes for. I have ordered and returned two sleeping bags. It is recommended that you get a three season bag that is warm to 20 degrees. The first one I ordered was a Kelty Cosmic 20. What they sent was not the bag I ordered. It was a different color, and I think it was the man’s bag. When I contacted the place to return it, the guy did not have a favorable review of Kelty, and said they only make their bags with zippers on the right side (I need left, since I am right handed). The other bag I ordered to try was the North Face Tephora. It seemed like a nice bag, but it was over 3 pounds. It was huge! I can’t imagine getting it small enough, even with a compression bag. I think it’s just too heavy, anyway, so I returned it. Down sleeping bags are recommended because they are light. Most of the really, REALLY light ones are $400-$500. I don’t want to spend that much. I’m considering getting a backpacking quilt. I think it might be a better solution for me. You use a sleeping pad to lay on for protection from the cold ground underneath. I’ve never used a mummy bag before. I think a mummy bag would be too clausterphobic-feeling for me. I’m a side or stomach sleeper, and Bud will tell you that I like to spread out when I sleep. When we have to stay in a hotel with a King Size bed, I love to spread out as if I’m making a snow angel for the joy of all of that room, and I also yodel waaayyy over to Bud, teasing him about the distance between us. I was talking to Bud about the sleeping bags, and he reminded me that I like to sleep pretty cold. I also remembered our adventure in this house before we got our wood stove and propane heater. We had some pretty darn cold temps, and I did just fine. We’ll see. I have found a backpacking quilt for $250, and I might order one. I’ve decided to keep the two-person Big Agnes Copper Spur. It’s a little more space for one person, room for Bud, too, in case he wants to go out with me sometime, and it’s not that much more weight than the one-person tent. I really like it. I chose the Copper Spur for many reasons. 1) It’s very light. 2) The entry is on the side, rather than the end. 3)It has a bathtub floor. 4) It’s very easy to set up. I’m now doubting my backpack choice. I don’t think it fits the way it’s supposed to. When the hip belt is secure, the shoulder straps don’t rest on my shoulders. They just sort of hang there, suspended above my shoulders. We are thinking about going to a R.E.I. in Kansas City. It’s about 4 hours away. If I find something else I like, I can just return my backpack there, instead of having to mail it in. I can also have them help me adjust it so that it fits like it’s supposed to. I really don’t have a clue, since I have not been backpacking before. I have my camp stove (MRS Pocket Rocket) and I have ordered my cookware (Evernew Titanium ECA 418). It supposedly has a non-stick coating on it. I also got a really cool titanium shovel called ‘The Deuce of Spades’ for digging cat holes. It’s very light. The clothes…bleh. I’m dreading that part. I’ve gotten a rain jacket and rain pants (which I am doubting myself on) and I also got a down jacket on sale. That’s about it…except for sports bras and sports undies…and a pair of quick drying shorts…and a hiking skirt that I’m not sure I feel comfortable with. It’s really the winter stuff, and base layers I’m confused about. I tried on some stuff at Bass Pro Shop and it was horrible. HORRIBLE, I tell ya. I hate shopping for clothes, period. I feel good about most of the purchases I have made so far because I have been able to find most of it on sale-some of it at a very deep discount. I have been very happy about that. If you haven’t done much hiking before, you wouldn’t realize what a learning curve there is when you start hiking, especially if you are preparing for an extended hike. It’s more than just ‘a long walk’. You will be on the trail for months, and everything you own will have to be carried in a backpack. You will be exposed to the elements (rain, wind, snow, cold, heat, etc.) and will be living in the woods for most of that time. Your ‘house’ will be your tent or a three-sided shelter, your food will have to be lightweight and easy to prepare, and your feet and body will bear the burden of all of that weight. A big part of this journey (for me) is researching and making my own decisions for my own trip. I’ve never been a great decision-maker, and have most often left decisions to others. Now, I’m in a place where I am the ‘one and only’ decision maker and I’ll have to live with the consequences of my decisions. I have ordered and returned so many things already! I keep wavering back and forth and this is after a LOT of research. Sometimes I feel like I am watching an episode of, ’48 Hours’ where I am being convinced that one person is the culprit. After the commercial break, I am convinced it is someone else who did it. Then, I go back to thinking the first person presented is IT. Thus it has been with hiking gear for me. Every argument I read for a particular product has pros and cons. It’s all a matter of choice and what will work best for me. Therein lies the problem, since I’ve not had much experience hiking. After I received the backpack (Flash Pack 65) I ordered online, I became convinced it was too big. The shoulder straps were hovering about 1-2 inches above my shoulders. I also thought that my shoes were not giving me enough support. Bud, my husband, (who has been my biggest advocate and cheerleader through all of this) suggested that we go to REI. He was willing to make the four hour drive to get to the nearest REI to us in Kansas City. Long story short, I got a lot of advice and help at REI, not to mention personal fitting for what I believe will be a great backpack. After my experience, I don’t see how anyone can really order their first backpack online. It turns out that I am borderline in sizing, between a Small and Extra Small. There were three backpacks I was going to try: The Osprey Ariel 65, REI Crest Trail 65, and Flash Pack 65 (in a smaller size). After being measured, I first tried on the Osprey Ariel in an XS, and it felt GREAT! I was almost sold on it, and then the guy helping me suggested that I try the Osprey Aura 65 AG. He did not have an XS in stock, so I tried on the Small. I also have to add here, that they had sand bags of certain weights which they stuffed in the packs so I could feel what it would be like with the weight I intended to carry in my pack. It was VERY helpful. 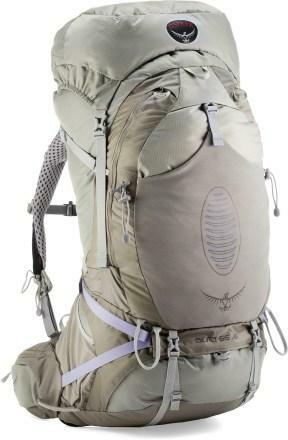 The Osprey Aura AG has ‘anti-gravity’ technology which makes you feel like you are carrying a lighter load, AND I COULD REALLY TELL THE DIFFERENCE. I was amazed at the difference between the Ariel and Aura. I was sold on the Aura AG 65 right then and there. The guy who was helping me felt that I needed an Extra Small, but since they did not have it in stock, it had to be ordered and shipped to me. When it arrived, I immediately put it on, and something felt horribly wrong. Even without weight in the pack, it was hurting my shoulders. Bud strongly felt that we should go back to REI (another four hour trip, one-way.) He was thinking that maybe it just needed to be adjusted. Although I was reluctant to make the drive again, I was thinking the same thing. I hated to make another long drive. Add to that, we had to be back in time to lock the chickens up before dark…so we made plans for another long, quick trip. This time, a different guy helped me, and he tried and tried to make the Extra Small work with different adjustments, but it just felt awful. He finally let me try on the Small again, and I let out a big sigh of relief. “Ahhh….this feels like the hip belt is resting where it was made to go!” I said. It was so much different! The hip belt rested around the top of my hips, and the shoulder straps were no longer cutting into the tops of my shoulders and chest. The weight of the pack was where it should have been…on my hips, rather than on my waist and my shoulders. The Extra Small felt like some kind of mutant baby was clinging to my back like a spider. The Small felt like a tightly swaddled papoose on my back. The moral of the story is: When looking for your first backpack, and you are inexperienced, go to a store where they can fit you for a pack and you can actually try them on! The sizes seem to vary with different models, even for the same maker. I was very impressed with REI. All of the workers there were a veritable fount of knowledge and experience. I also tried on yet more shoes while I was there the first time. The girl who helped me was a hiker, and when she found out the weight of my pack, she suggested a more sturdy shoe. I tried on some Keen Targhee II’s (which I really liked), but then she suggested that I *just try* another shoe which supported the ankles more. I had been opposed to boots because I didn’t want a really heavy shoe. They had a fake boulder there in the shoe department which I was able to climb to see how the shoes would work on the terrain I’ll be hiking on. I have been a little worried in the back of my mind about not having any ankle support, since I rolled my ankle last year. I’ve heard that once you roll or sprain your ankle, you are much more likely to do it again. These are not as light as trail runners, but they are much lighter than traditional, leather hiking boots. They give my ankles much more support, they feel like there is much more support on the bottom of my shoe. I don’t feel rough terrain as much (like walking on the gravel road here at home), they have great traction, my toes have plenty of wiggle room, my toes don’t even come close to hitting the tip of my shoes. I have hiked 6-9 miles about 5 times in them, and I don’t have any hot spots, no blisters, no rubbing, no squished toes, etc., and they aren’t even broken in yet! They are also water-proof. 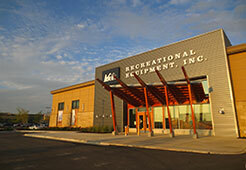 REI allows returns for up to one year, no matter what the reason or condition of the item. Though these shoes are more expensive than trail runners, I’ve read that trail runners have to be replaced at least four times on a thru-hike. 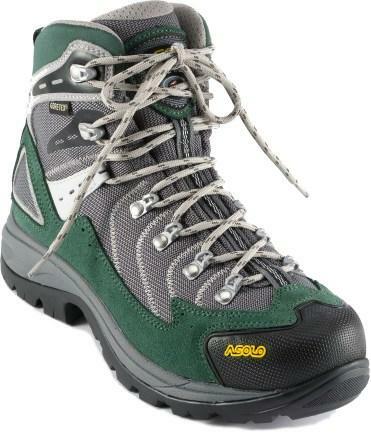 According to reviews, there are people who have had these ASOLO’s for 12 or more years and they still look almost new, with no tears or signs of wearing. I’m still learning how to pack my backpack, and I’m already trying to cut my pack weight. I’ve taken one walk with the backpack with all of my stuff (minus food) and it seems really heavy to me. I made an EXCEL spreadsheet with the weight of all of my items and it was about 17 pounds. (This includes the weight of the pack which is 4 pounds, 2 ounces.) I want to get a scale to actually weigh the pack, because I’m not sure this is correct. It’s all based on weights listed on websites, not actual measured weight. We have some ‘hills’ around here that are pretty respectable as hikes go. They aren’t easy. I went about 5 miles with the loaded pack. I came back with a beet red face, and Bud looked worried and told me to sit in front of a fan and ‘recover’. LOL. When I add my food to the backpack -right now- the estimate of my loaded pack will be 31.5 pounds. I’m 5’2″and I don’t know if this amount of weight is typical for someone my height to carry. I think I weigh about 120 pounds, but I might be a more. I’m looking to try to cut some of the pack weight. As I think about hiking 15-20 miles a day, I can’t imagine carrying that much weight (the 21.5 pounds of my pack is without food.) It was do-able on even ground, but climbing the hills was tough. When my pack is up to 31.5 pounds…I’m just not sure how it will be. Maybe you get use to carrying that much weight as you get stronger and hike more. I don’t know. If anyone has any advice or suggestions, I’m open to hear it! I have been trying to connect with a hiking club in this area in hope that I can do some ‘shake-down’ hikes and get some practical, hands-on advice. My first ‘outing’ will be camping either in front of our house, or if I’m really brave, somewhere on our land. 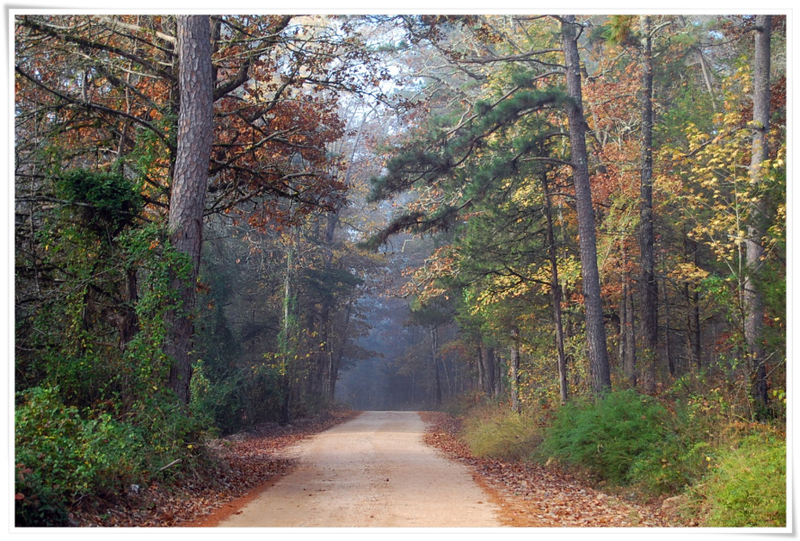 We have about 30 acres deep in the heart of the Ozarks. It’s wild enough that we have seen deer, Elk, wild turkeys and pigs. Some of our neighbors have seen a black bear. I have never camped alone, so camping in our front yard will be a big first step for me. I want to try out all of my gear (set up my tent, cook some food, pack everything up, etc.) before I take a real over-night hike.